First and foremost is Ultrabland by Lush, which is one of those balm cleansers that everyone raves about. I'm popping in to Lush today and asking for a sample, so I'll let you know how I find it! Next up is the Moringa Body Butter from the Body Shop, which is two of my favourite things: the scent of moringa in one of their body butters, which I luuurve anyway. Perfection. I've recently become a big fan of hydrating mists, and the Hydrating Mist Toner from Trilogy looks dreamy. They're a perfect middle step in your skincare routine and I find them to be soooo refreshing. I've tried a little sample of moisturiser from Manuka Doctor before but never anything from their apiclear range, so I'm dying to give the apiclear Skin Treatmen Serum a go! 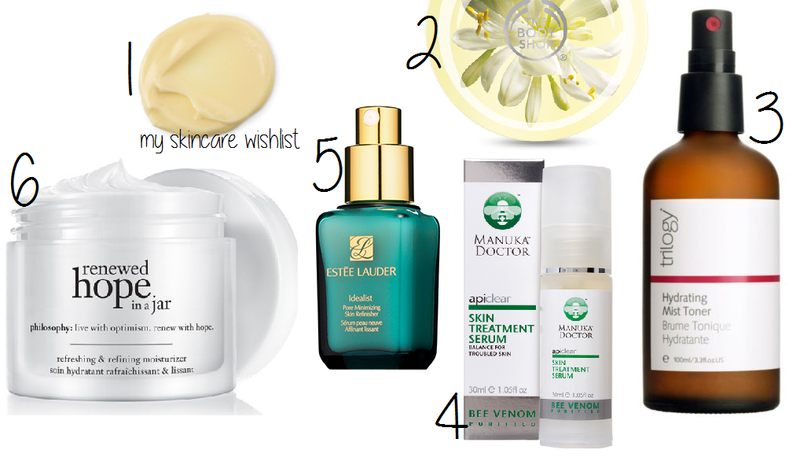 The Estee Lauder Idealist is also a serum, but obviously it's a lot more of a high end treat. I love the packaging and I bet it smells amazing. Last but not least is renewed hope in a jar from Philosophy, which is a moisturiser I've heard so many people raving about. I'm always on the hunt for the perfect final step to my skincare routine and this looks amazing! Have you tried any of these products - let me know! Keep your eyes out on mine and Sam's blogs for what will no doubt be a lot of skincare reviews. Also, we filmed our coming out video so pleaseeee go give it a watch and maybe leave us a comment HERE!